The Korean Peninsula first divided along the 38th parallel, later along the demarcation line. The division of Korea into South Korea and North Korea was the result of the 1945 Allied victory in World War II, ending the Empire of Japan's 35-year colonial rule of Korea by General Order No. 1. The United States and the Soviet Union agreed to temporarily occupy the country as a trusteeship with the zone of control along the 38th parallel. The purpose of this trusteeship was to establish a Korean provisional government which would become "free and independent in due course", as set forth in the Cairo Conference. Japan capitulated in August 1945. An effort to construct an independent government for the entire Korea was made in September 1945 by the statesman Lyuh Woon-hyung. However, he had to step down under pressure from the United States Military Government. An initiative to hold general and free elections in the entire Korea came up in the United Nations in the Autumn of 1947. However, this initiative did not materialize because of a disagreement between the United States and the Soviet Union: During this period of two years between the fall of 1945 and the fall of 1947, in the absence of the opportunity to set up a unified government, two separate governments began evolving and consolidating in the south and in the north. A Communist state was permanently established under Soviet auspices in the north and a pro-U.S. state was set up in the south. The two superpowers backed different leaders and two States were effectively established, each of which claimed sovereignty over the whole Korean peninsula. The Korean War (1950–53) left the two Koreas separated by the Korean Demilitarized Zone through the Cold War and beyond. The twenty-first century saw some improved relations between the two sides, overseen in the south by liberal governments, who were more amicable towards the north than previous governments had been. These changes were largely reversed under conservative South Korean president Lee Myung-bak who opposed the north's continued development of nuclear weapons. In addition to this, after the death of Kim Jong-il, the incumbent supreme leader, Kim Jong-un threatened to bomb parts of South Korea. As the Russo-Japanese War ended in 1905, Korea became a nominal protectorate, and was annexed in 1910 by Japan. For Korean nationalists who wanted immediate independence, the phrase "in due course" was cause for dismay. In any case, discussion of Korea among the Allies would not resume until Germany was defeated. Regional movement of Soviet forces in 1945. With the war's end in sight in August 1945, there was still no consensus on Korea's fate among Allied leaders. Many Koreans on the peninsula had made their own plans for the future of Korea, and few of these plans included the re-occupation of Korea by foreign forces. Following the atomic bombing of Hiroshima on August 6, 1945, Soviet soldiers invaded Manchuria, as per Stalin's agreement with Roosevelt at the Yalta Conference of February 1945. However, American leaders were suspicious of the people's committees forming all over the peninsula, and suspected that without American intervention, the whole peninsula would elect to come under Communist government and Soviet influence. Soviet forces arrived in Korea first, but occupied only the northern half, stopping at the 38th parallel, per the agreement with the United States. On August 10, 1945 two young officers – Dean Rusk and Charles Bonesteel – were assigned to define an American occupation zone. Working on extremely short notice and completely unprepared, they used a National Geographic map to decide on the 38th parallel. They chose it because it divided the country approximately in half but would leave the capital Seoul under American control. No experts on Korea were consulted. The two men were unaware that forty years before, Japan and Russia had discussed sharing Korea along the same parallel. Rusk later said that had he known, he "almost surely" would have chosen a different line. Regardless, the decision was hastily written into General Order No. 1 for the administration of postwar Japan. General Abe Nobuyuki, the last Japanese Governor-General of Korea, had been in contact with a number of influential Koreans since the beginning of August 1945 to prepare the hand-over of power. On August 15, 1945, Lyuh Woon-hyung, a moderate left-wing politician, agreed to take over. He was in charge of preparing the creation of a new country and worked hard to build governmental structures. On September 6, 1945, a congress of representatives was convened in Seoul. The foundation of a modern Korean state took place just three weeks after Japan's capitulation. 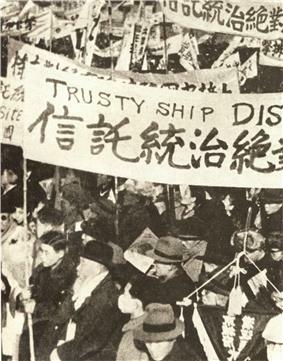 The government was predominantly left wing; many of those who had resisted Japanese rule identified with Communism's views on imperialism and colonialism. Lyuh Woon-hyung giving a speech in the Committee for Preparation of Korean Independence in Seoul on August 16, 1945. On September 7, 1945, General MacArthur announced that Lieutenant General John R. Hodge was to administer Korean affairs, and Hodge landed in Incheon with his troops the next day. The troops occupied Southern Korea and took over comfort stations, then many women in comfort stations began working as a western princess. The Provisional Government of the Republic of Korea sent a delegation with three interpreters, but Hodge refused to meet with them and refused to recognize the People's Republic of Korea or the Korean Provisional Government. In September 1946, thousands of laborers and peasants rose up against the Allied Military Government. This uprising was quickly defeated, and failed to prevent scheduled October elections for the South Korean Interim Legislative Assembly. The U.S. military has maintained a presence on the Korean Peninsula through to the present day. The former President of the Provisional Government of the Republic of Korea, the government-in-exile in Shanghai, and ardent anti-communist Syngman Rhee, was considered an acceptable candidate to provisionally lead the country since he was considered friendly to the US, having traveled and studied stateside. Under Rhee, the southern government conducted a number of military campaigns against left-wing insurgents who took up arms against the government and persecuted other political opponents. Over the course of the next few years, between 30,000 and 100,000 people would lose their lives during the war against the left-wing insurgents. In April, 1948, Jeju islanders rose up against South Korean officials, and South Korea sent troops to repress the rebellion. Tens of thousands of islanders were killed and by one estimate, 70% of the villages were burned by the South Korean troops. The uprising lasted until the end of the Korean War. In August 1948, Syngman Rhee became the first president of South Korea. In October 1948, the Yeosu–Suncheon Rebellion took place, in which some regiments rejected the suppression of the Jeju uprising and rebelled against the government. In 1949, the Syngman Rhee government established the Bodo League in order to keep an eye on its political opponents. The majority of the Bodo League's members were innocent farmers and civilians who were forced into membership. The registered members or their families were executed at the beginning of the Korean War. On December 24, 1949, South Korean Army massacred Mungyeong citizens who were suspected communist sympathizers or their family and affixed blame to communists. Welcome Celebration for Red Army in Pyongyang on 14 October 1945. Throughout August 1945, Koreans organized people's committee branches for the "Committee for the Preparation of Korean Independence" (CPKI, 조선건국준비위원회). The Soviet Army allowed these committees to function since they were friendly to the Soviet Union, and Colonel-General Terentii Shtykov set up the Soviet Civil Administration to begin to centralize the independent committees. Further provisional committees emerged across the country, putting Communists into key positions. In February 1946 a in China or in Vietnam. Official American sources stated: "From all accounts, the former village leaders were eliminated as a political force without resort to bloodshed, but extreme care was taken to preclude their return to power." The farmers responded positively; many collaborators and former landowners fled to the south, where some of them obtained positions in the new South Korean government. According to the U.S. military government, 400,000 northern Koreans went south as refugees. Key industries were nationalized. The economic situation was nearly as difficult in the north as it was in the south, as the Japanese had concentrated agriculture in the south and heavy industry in the north. Soviet forces departed in 1948. South Korean demonstration in support of the U.S.-Soviet Joint Commission in 1946. With mistrust growing rapidly between the formerly allied United States and Soviet Union, no agreement was reached on how to reconcile the competing provisional governments. The U.S. brought the problem before the United Nations in the fall of 1947. The Soviet Union opposed UN involvement. South Korean general election on May 10, 1948. The UN passed a resolution on November 14, 1947, declaring that free elections should be held, foreign troops should be withdrawn, and a UN commission for Korea, Pyongyang. This conference produced no results, and the Soviets boycotted the UN-supervised elections in the south. There was no UN supervision of elections in the north. On May 10, 1948 the south held a general election. On August 15, the "Republic of Korea" formally took over power from the U.S. military. In the North, the "Democratic People's Republic of Korea" was declared on September 9, with Kim Il-sung as prime minister. This division of Korea, after more than a millennium of being unified, was seen as controversial and temporary by both regimes. From 1948 until the start of the civil war on June 25, 1950, the armed forces of each side engaged in a series of bloody conflicts along the border. In 1950, these conflicts escalated dramatically when North Korean forces invaded South Korea, triggering the Korean War. The Korean Armistice Agreement was signed three years later ending hostilities and effectively making the division permanent. The two sides agreed to create a four-kilometer-wide buffer zone between the states, where nobody would enter. This area came to be known as the Demilitarized Zone. As dictated by the terms of the Korean Armistice, a Geneva Conference was held in 1954 on the Korean question. Despite efforts by many of the nations involved, the conference ended without a declaration for a unified Korea. The Armistice established a Neutral Nations Supervisory Commission (NNSC) which was tasked to monitor the Armistice. Since 1953, members of the Swiss and Swedish Armed Forces have been members of the NNSC stationed near the DMZ. Although the truce seemingly ended the war between North and South Korea, it is often regarded as a truce in name only. This proved to be especially true after the attack of ROKS Cheonan sinking, the world has their eyes on North Korea's next move, and two Koreas' tension has flared since then. The incident chilled inter-Korean relations and seemed to freeze all exchanges between the two Koreas. As soon as the investigation team revealed that the Cheonan was sunk by North Korea, President Lee implemented countermeasures called the May 24 Measures. The South Korean government suspended all inter-Korean exchanges and cooperation with the North, except for business operations in the Kaeseong Industrial Complex and the pure humanitarian aid for the underprivileged people in North Korea. There is a great deal of skepticism towards North-South Korea relations. Economically, it is commonly alleged that the South provides a great deal of support to the North whilst receiving nothing in return. However, compared to the previous South Korean government or the former West German aid to East Germany, the Kim Dae Jung administration's assistance to North Korea has been rather minuscule. The aid to North Korea in the year 2000 was only .017 percent of South Korea's GDP, less than one-fourth of the former West Germany's annual aid to East Germany. While it may seem low, it must be remembered that during the year 2000, much of the South Korean government had considered the Sunshine Policy as dead. Beginning in 1998, the South Korean president Kim Dae-jung has made efforts to reunify the Korean peninsula by creating the Sunshine Policy. This policy was meant to ease tensions between South Korea and North Korea after so many years after the Korean War. It initially was meant so that instead of treating North Korea like a caged animal, South Korea and North Korea would work together and discuss any issues within the peninsula  However, the South Korean government has recently stated that the nuclear arms program in North Korea has killed the Sunshine Policy. As such, the South Korean government no longer desires cooperation with North Korea since North Korea refused to meet all its demands. On July 7, 1988, with the announcement of the Presidential Declaration for National Self-esteem Unification and Prosperity, South and North Korea officially promoted inter-Korean exchanges and cooperation. These exchanges halted temporarily when North Korea withdrew from the NPT in March 1993, but it eventually resumed its course and remains in effect to the present day. Up until 1989, only one person crossed the border but that number has increased over the years and now stands at 130,000. Inter-Korean trade recorded 19 million US dollars in 1989 but it reached 1.9 billion US dollars in 2010. Additionally, the total amount of humanitarian aid from 1995 to late 2010 equals approximately 2.9 billion US dollars. The foreign relations that define the place of North and South Korea in the world community today are product of the trajectories. Starting with 1945 nation building process of South Korea led by US, South has been allied with United States whereas North Korea has allied with China and Russia. However, with the increasing prosperity of China and its power in the international society, North Korea has limited power in China. Since the division of Korea, there have been numerous instances of infiltration and incursions across the border largely by North Korean agents, although the North Korean government never acknowledges direct responsibility for any of these incidents. A total of 3,693 armed North Korean agents have infiltrated into South Korea between 1954 to 1992, with 20% of these occurring between 1967 and 1968. According to the 5 January 2011 Korea Herald, since July 1953 North Korea has violated the armistice 221 times, including 26 military attacks. March 1975: A second North Korean infiltration tunnel was discovered. 18 August 1976: The axe murder incident resulted in the death of two U.S. soldiers and injuries to another four U.S. soldiers and five South Korean soldiers in a neutral zone of the Joint Security Area. March 1981: Three North Korean infiltrators were spotted at Kumhwa, Gangwon-do; one was killed. July 1981: Three North Korean infiltrators were killed in the upper stream of the Imjin River. May 1982: Two North Korean infiltrators were spotted on the east coast; one was killed. April 1997: Five North Korean soldiers cross the military demarcation line's Cheorwon sector and fired at South Korean positions. May 2006: Two North Korean soldiers entered the DMZ and cross into South Korea. They returned after the South fired warning shots. October 2006: South Korea fired warning shots after North Korean soldiers crossed briefly into their side of the border. 23 November 2010: After a Northern warning to cease planned military drills near the island of Yeonpyeong, the South commenced the drill. The North then bombarded the island with heavy artillery in response to the firings related to the South's readiness exercise and the South returned fire with howitzers. On Yeonpyeong, 4 were killed (including 2 civilians) and 15 injured. 10 October 2014: South Korean forces fired 40 machine gun rounds at North Korean forces who had fired for 20 minutes at propaganda balloons flying across the DMZ from South Korea. 19 October 2014: North and South Korean forces exchanged small arms fire for 10 minutes after South Koreans fired warning shots at a North Korean patrol approaching the DMZ. June 1969: A North Korean agent reached Huksan Island, resulting in 15 killed. August 1975: Two North Korean infiltrators were intercepted at Gochang County, Jeollabuk-do One infiltrator and two South Korean soldiers were killed and another two South Korean soldiers were wounded. November 1978: Three North Korean agents killed two South Korean civilians in Hongseong, one civilian in Gongju, Chungcheongnam-do and another civilian at Osan, Gyeonggi-do. November 1980: Three North Korean infiltrators and one South Korean civilian were killed at Whenggando, Jeollanam-do. Six others were wounded. December 1980: Three North Korean infiltrators and two South Korean soldiers were killed off the southern coast of Gyeongsangnam-do. Two other South Korean soldiers were wounded. September 1984: A North Korean infiltrator killed two civilians and wounded another at Daegu before committing suicide. October 1995: Two North Korean infiltrators were intercepted at Buyeo County. One was killed, the other captured. June 1981: A North Korean spy boat was sunk off Seosan, Chungcheongnam-do, with nine agents killed, 91 injured and one captured. October 1985: A North Korean spy ship was sunk by the South Korean navy off the coast of Busan. May 1996: Five North Korean naval patrol craft entered South Korean waters off the west coast and withdrew after a four-hour confrontation with Southern forces. Another incident in June 1996 saw three North Korean naval patrol craft intruding for three hours in the same area. 17 September 1996: in the 1996 Gangneung submarine infiltration incident a disabled North Korean submarine was spotted on the east coast near Jeongdongjin, 20 kilometres south-east of Gangneung, Gangwon-do. The 11-man submarine crew was apparently killed by North Korean commandos onboard after the submarine was grounded. 13 of the North Korean commandos were killed by South Korean soldiers as they tried to make their way back over the DMZ over the next 49 days; one was captured and one escaped. 13 South Korean soldiers and 4 civilians were killed, and five others wounded. North Korea threatened to retaliate over the incident, and in October 1996, a South Korean diplomat, Choe Deok-geun, was found poisoned in Vladivostok by a substance similar to that carried on the submarine. By 29 December, however, the North issued an official statement expressing "deep regret" over the submarine incident, although it did not issue a direct apology. In return, the South Korean government returned the cremated remains of the infiltrators to the North via Panmunjom on 30 December. June 1997: Three North Korean patrol boats entered South Korean waters in the Yellow Sea, firing at South Korean patrol boats. 22 June 1998: in the 1998 Sokcho submarine incident, a North Korean Yugo-class submarine was found caught in fishing nets in South Korean waters 18 km off the coast from Sokcho. South Korean fishermen observed the crew trying to untangle the submarine from the fishing nets and notified the South Korean navy. The submarine was subsequently towed by a South Korean corvette to a navy base near Sokcho. The submarine sank as it approached the base; it was later salvaged, and when opened all nine crew were found dead in an apparent group suicide. North Korea criticized the South for causing the death of the crew and demanded the return of the bodies and submarine on 27 June. South Korean President Kim Dae-jung asked for the North to "admit responsibility and take reasonable measures" in response. November 1998: A North Korean spy boat entered South Korean waters near Ganghwa Island but escaped upon detection. 17–18 December 1998: In the Battle of Yeosu, a North Korean semi-submersible boat was sunk near Yeosu after an exchange with the South Korean navy. A North Korean frogman's body was found near the site. June 1999: A nine-day confrontation was sparked when several North Korean ships intruded into disputed waters near the Northern Limit Line in the Yellow Sea. A firefight erupted on 15 June 1999, sinking a North Korean torpedo boat and damaging five others. Two South Korean vessels were lightly damaged. North Korea issued a warning that violent exchanges would continue if the disputed waters were to continue being intruded by South Korea or the United States. 9 April 2001: North Korean patrol boats entered South Korean waters briefly over the Northern Limit Line but retreated when challenged by the South Korean Navy. Similar incidents were reported on February 5, March 3 and April 10. 12 maritime intrusions were reported in total in 2001. 5 January 2002: North Korean patrol boats continued to infiltrate into South Korean waters, with another craft spotted off Yeonpyeong Island in the Yellow Sea. 29 June 2002: North Korean patrol boats crossed the Northern Limit Line and fired at a South Korean patrol boat. This provoked a firefight. The South Korean boats sustained 24 casualties and was sunk while returning to port. Following heavy fire the North Korean vessel retreated and sustained 38 casualties. Although it managed to make its way back to port, the boat was severely damaged. 11 November 2009: North Korean patrol ship was fired on after attacking a South Korean ship in the Yellow Sea. 26 March 2010: The South Korean warship Cheonan sank, killing 46 sailors. On 19 May 2010 an investigation said a North Korean submarine caused the sinking. 15 April 1969: A North Korean fighter jet shot down an EC-121 over the Sea of Japan; 31 American servicemen were killed. 19 February 2003: A North Korean fighter jet entered South Korean airspace over the Yellow Sea, the first since 1983. Six South Korean fighter planes responded, and the North Korean plane departed after two minutes. 17 June 2011: South Korean soldiers mistakenly fired on an Asiana commercial airplane with small-arms fire; they believed it to be a North Korean military aircraft. ^ Feffer, John (June 9, 2005). "Korea's slow-motion reunification". Boston Globe. Retrieved 2007-08-13. ^ Walker, J Samuel (1997). Prompt and Utter Destruction: Truman and the Use of Atomic Bombs Against Japan. Chapel Hill: The University of North Carolina Press. p. 82. ^ Seth, Michael J. (2010). 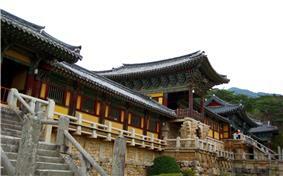 A History of Korea: From Antiquity to the Present. Rowman & Littlefield. ^ Oberdorfer, Don. The Two Koreas. Basic Books, p. 6. ^ Arthur Millet, The War for Korea, 1945–1950 (2005). ^ Jon Halliday and Bruce Cumings, Korea: The Unknown War, Viking Press, 1988, ISBN 0-670-81903-4. ^ "Gov’t Killed 3,400 Civilians During War". ^ Cumings, Bruce. The Origins of the Korean War: Liberation and the Emergence of Separate Regimes, 1945–1947. Princeton University Press, 1981, 607 pages, ISBN 0-691-09383-0. ^ Allan R. Millet, The War for Korea: 1945–1950 (2005) p. 59. ^ Gbosoe, Gbingba T. (2006). Modernization of Japan. iUniverse. p. 212. ^ "NNSC in Korea" (PDF). ^ Jager, Sheila Miyoshi. Brothers At War: The Unending Conflict in Korea. 1st ed. New York: W. W. Norton &, 2013. Print. ^ Cha, Victor. The Impossible State: North Korea, Past And Future. New York: HarperCollins, 2012. Print. ^ Jager, Sheila Miyoshi. Brothers At War: The Unending Conflict in Korea. 1st ed. New York: W.W. Norton &, 2013. Print. ^ Kim, Samual S. The Two Koreas and The Great Powers. 2006 Cambridge University Press. ^ North Korea: Chronology of Provocations, 1950–2003. Retrieved 2010-01-15. ^ The Korea Herald, "N.K. Commits 221 Provocations Since 1953", 5 January 2011. ^ "Minutes of Washington Special Actions Group Meeting, Washington, August 25, 1976, 10:30 a.m.". ^ Incursions. Korean DMZ. Retrieved on 2013-07-12. ^ "North Korean artillery hits South Korean island". BBC News. 23 November 2010. ^ Michael Pearson, CNN (10 October 2014). "North and South Korea exchange fire". CNN. Retrieved 5 April 2015. ^ "'"North and South Korea 'exchange fire over border. BBC News. Retrieved 5 April 2015. ^ Efron, Sonni (1998-06-23). "S. Korea Seizes Another Northern Sub Off Coast". Los Angeles Times. ^ "North Korea ship 'in flames after naval clash', says Seoul". ^ "(Cheonan attack) (News Focus) S. Korea working on diplomatic, military options against N. Korea". English.yonhspnews.co.kr. Retrieved 18 October 2014. ^ Shim, Sung-won (June 18, 2011). "South Korean troops shoot at civilian airliner by mistake". Reuters. Retrieved 2011-11-13. Hoare, James; Daniels, Gordon (February 2004). "The Korean Armistice North and South: The Low-Key Victory [Hoare]; The British Press and the Korean Armistice: Antecedents, Opinions and Prognostications [Daniels]". The Korean Armistice of 1953 and its Consequences: Part I (PDF) (Discussion Paper No. IS/04/467 ed.). London: The Suntory Centre (London School of Economics).